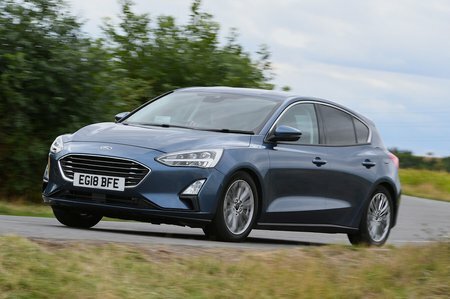 Ford Focus 1.5 EcoBoost 150 ST-Line Nav 5dr 2019 Review | What Car? What Car? will save you at least £1,857, but our approved dealers could save you even more. The Ford Focus stands out as the best driver’s car in the class, with handling that truly entertains. It's complemented by a fine ride that almost matches a Volkswagen Golf for comfort and passenger space very nearly on a par with the Skoda Octavia. It's mainly the iffy interior quality and slightly lacklustre performance that mark it down. If you like something a little sportier, this is the trim to go for. It comes with everything that Zetec has, plus 17in alloy wheels, sports suspension, LED front foglights, chromed exhaust tailpipes, alloy pedals, more aggressive bodystyling and keyless go. If you regularly carry lots of people and need more oomph, the 1.5 petrols have a bit more guts. Thus far, we’ve tried only the 180bhp version, though.